Kapalabhati breath, also known as “breath of fire”, is truly powerful. Directly translated from sanskrit, it means “skull polishing breath”. The ancients used this pranayama to cleanse their bodies from toxins and negative energy. It clears out the entire respiratory system and airways, and also invigorates the nervous system within the brain and throughout the body. In Patanjali’s eight-limbed path, “niyamas” represent the second limb of yoga. Translated, niyamas are disciplines and observances one takes when on a spiritual path. An avid yoga student may choose to take on some of these practices for a deeper understanding of the yogic way of life. One of the five niyamas is “saucha” or cleanliness. Breath of fire is an excellent way to clean the body, mind, and spirit. This purification process leads to a deeper sense of self, ultimately guiding us to a more compassionate way of being. In spiritual ceremonies, fire is used as a symbol of purification. Kapalabhati pranayama certainly taps into your own inner flame. On the more spiritual realm, this breath can help you to reach higher levels of consciousness, awakening you from within. On the physical plane, breath of fire will treat your body to a spa day without you ever leaving your mat! These rapid inhales and exhales work the ab muscles, making kapalabhati pranayama totally beachbody worthy. This breath technique works the core underneath the surface layer of the abdomen and stabilizes your body’s center. If you practice this breath for 15 minutes, you can even skip ab day! Breath of fire produces a ton of oxygen that goes directly into the bloodstream and to the brain. According to this study by PubMed, oxygen therapy can produce the same alieving effects as psychotherapy for anxiety and depression. If more oxygen is what we need to feel better, Kapalabhati pranayama might be a great place to start. The quick exchange of carbon dioxide and oxygen gets rid of toxic byproducts from the lungs in favor of pure oxygenated air. In addition, this rhythmic pattern of breathing cleanses the airways. Remember that kapalabhati means “skull polishing breath”, and engaging in this practice physically, mentally and spiritual purifies the body. Breath of fire revs the circulatory system as oxygen moves through the bloodstream even faster than when using the natural breath. Increased oxygen in the blood helps other organs process biomatter, and it also improves lymphatic functions in the body. Kapalabhati can be internally detoxifying when performed for a number of minutes. Given that kapalabhati is so concentrated in your abdomen and solar plexus, it also targets digestion. This breath technique increases blood flow to the belly and is an efficient way to speed up the break down and conversion of food into fuel or byproduct. To practice breath of fire, begin in a seated position on your mat or on a pillow. If you are sitting on your yoga mat, come into diamond pose or easy pose. In any pranayama work, your spine must extend from the tailbone up to the crown. The length in your back will determine the efficiency and capacity of your breath. If your spine feels tight or tense, begin your practice with a few warm ups such as cat-cow, child’s pose, or any sun salutation. Once seated and settled, check in with your thoughts. Familiarize yourself with what is present in your mind. How do you feel emotionally about what’s happening here? Are you willing and ready to let go of anything that is not relevant to your breath? Scan your body and notice anything about your physical presence. Start from the feet and work your way up to the head. Pay special attention to the muscles of the face, as these are often triggered during times of stress. Do you feel sore or tense somewhere? How is your body holding your feelings? Throughout this mindfulness process, take slow inhales and complete exhales. After your 3-5 minute check-in, take a deep breath in and exhale it out with a sigh. Feel better? You are now ready for kapalabhati. Inhale through the nostrils as quickly as you exhaled, filling the belly with air. Now exhale as quickly again and bring the abs back in. Continue this pattern of rapid inhales and exhales through the nose. Try to be as rhythmic and consistent as possible, and make sure you are getting an equal exchange of oxygen and carbon dioxide. The target pace for breath of fire should be around 2-3 breaths per second. This includes both the inhale and the exhale. That being said, if you are just starting out with breath of fire, take it slower. Begin with 1 breath per second and assess how this feels in your body. Make sure you are getting enough air flow and keep the chest open as you breathe. Once you feel comfortable with that modified pace, double the speed to 2 breaths per second. You can stop here, or make the breath slightly more rapid, but no quicker than 3 breaths per second. You don’t have to time yourself, rather, just feel the inhales and exhales instead. 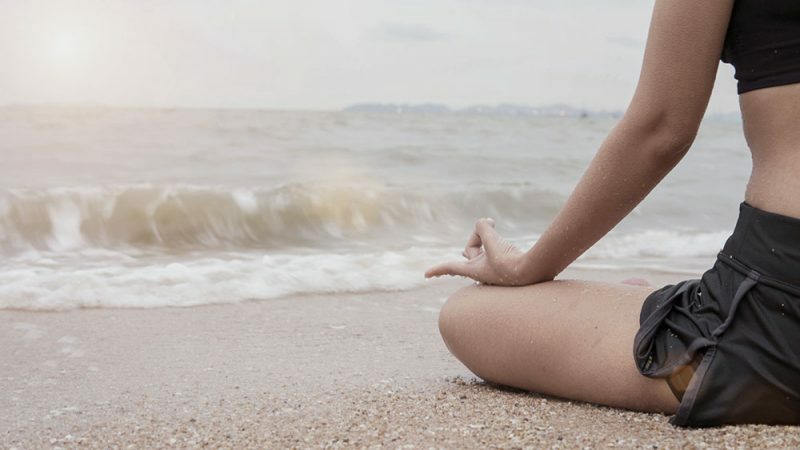 It is important to be in tune with how your body feels during any pranayama practice. Kapalabhati should be performed for 30 seconds at first. As you become more familiar with this breath and how your body responds, increase in 30 second intervals. Breath of fire should not be performed longer than 5 minutes at a time. A moderate practice would be roughly 3 minutes. 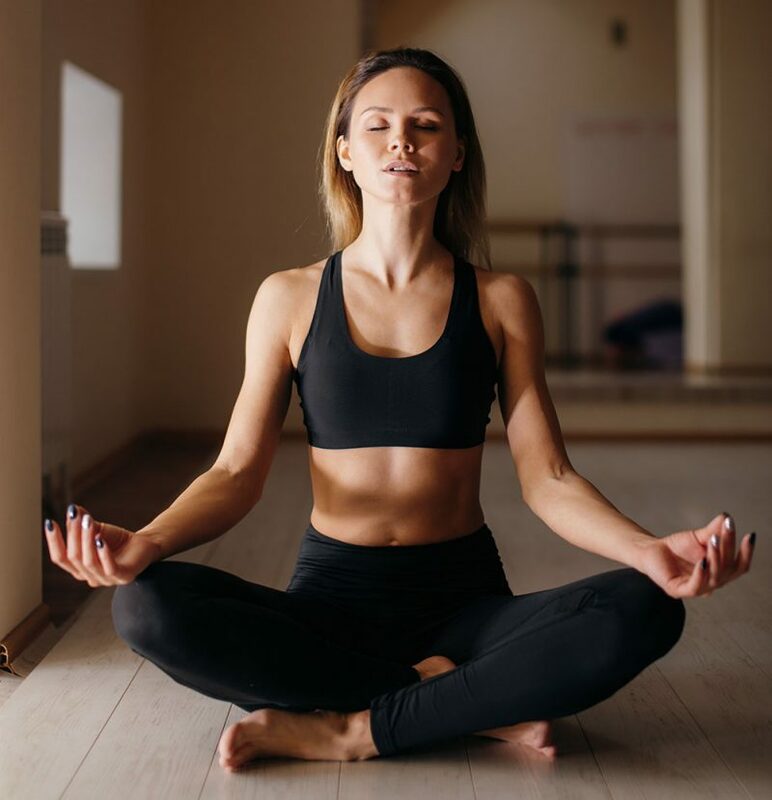 After practicing the breath for your intended amount of time, take a deep breath in through the nose and hold it at the top of your inhale for 5 seconds. Exhale deeply and completely, squeezing all the air out of your lungs. Return to a natural breath and observe what is present. If you have high blood pressure, respiratory issues, sinus issues, a heart condition, a herniated disc, abdominal pain, a stomach illness, or are pregnant, you should not perform kapalabhati breath. Any of these conditions could be exacerbated by this rapid and more forceful nature of breathing. You should also only practice breath of fire at least 3 hours after eating. Because it utilizes the abdominal muscles and lungs more forcefully, performing this breath immediately after a meal might be uncomfortable for the digestive tract. In addition, if you are extremely constipated, you may also wish to avoid kapalabhati. When you are starting out with a new pranayama, you aren’t going to be perfect the first time around, and that’s okay! Let your mistakes be your guide and allow yourself to learn through the experience. You want your solar plexus to be working the most here rather than the lower abdomen. If you’re having trouble locating where you should be moving the breath through the body, place three fingertips into the diaphragm. As you perform kapalabhati breath, you should feel this area quickly moving back and forth. Concentrate on this area of the core with every inhale and every exhale. Because the abdomen is working quite strongly during this practice, check in with yourself after 30 seconds to make sure that you do not feel sore or uncomfortable. It is possible to get muscle cramps if you are squeezing too tightly, so be cautious and mindful of how your physical body is responding. While breath of fire feel like a more shallow breath due to the rapid nature of inhales and exhales, it should not deprive you of getting enough air. If you feel light headed at all, stop and return to a normal breath. To gain better control, perform breath of fire more slowly. Make sure that you are breathing in and out at the same pace. If you aren’t getting enough oxygen because your exhales are longer, your breath won’t sustain you and will make you prone to feeling dizzy. If you are inhaling longer than you are exhaling, you can over oxygenate yourself, which can make you feel nauseated or “loopy”. Take this breath slow and be gentle with yourself. Patience is key! – Kapalabhati pranayam is known as “breath of fire”. 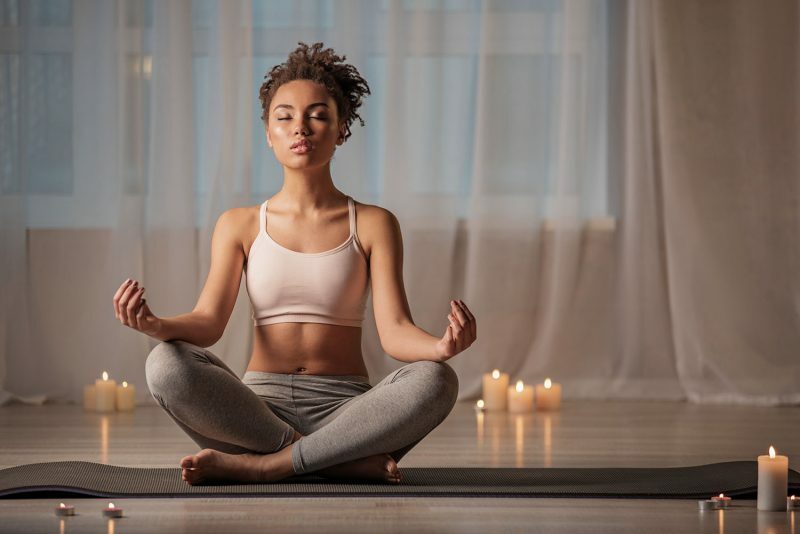 – Practice breath of fire to cleanse and purify the mind-body-spirit connection, detox the body, strengthen the core, improve circulation, aid in digestion, and alleviate anxiety. – If you are breathing at full capacity, take 2-3 breaths per second. – Begin with 30 seconds of practice, and increase in 30 second increments. – Do not exceed 5 minutes of practice. Any pranayama practice will help deeper your yogic experience. Breath of fire can be simply transformative in all aspects of the self. Enjoy the benefits of this practice, and remember to be kind with yourself!